I took a step back once I’d written my response. I realized that it sounded pretty harsh and very strict. Here’s the thing that I realized though, I do pick my battles. But, once I’ve picked it, I try to be as consistent as possible and have consequences. 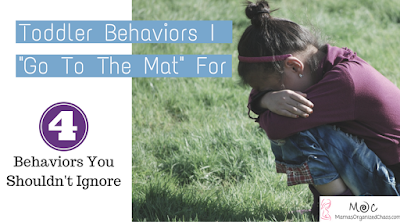 So, I wanted to take a moment to discuss specific behaviors that we expect, and what our responses are if those expectations are not followed. I’ll also talk about battles that I choose not to address. I wouldn’t classify them as “things I let go” as I originally stated in my FB response, because the reality is that I never put an expectation out there that I had to let go of. I just know that these things would turn into battles that would not be worth anyone’s time. So my original list was really spot on, and it encompasses a LOT! Before I go through these 4 things that I “go to the mat for”, I feel it is important to point out that we try not to create battles in this house. We try to give our daughter ownership of her actions by providing her with choices whenever possible. I strongly believe you can avoid most battles simply by the way you approach situations. 1. Safety- Being safe is something we don’t mess around with in this family. What we do, however, is give our daughter a heads up as to our expectations when in new environments. If I am expecting her to hold my hand, then I tell her that before we arrive at our location. I do try and provide options here if possible. “You can hold my hand and walk, or you can sit in the cart”. She can choose which one she wants to do, and she is prepared to make her choice because we’ve talked about it ahead of time. She feels as if she’s in control, because she’s making the choice. This makes her much more likely to be happy about the situation. Now think about how this situation could have gone differently: No heads up talk about expectations. We arrive where we are going and let’s say she’s refusing to hold my hand and running off. As a frustrated parent, it’s easy to say “hold my hand and listen, or we are leaving”. That is a threat, and somewhat confrontational. It happens to all of us, but the problem is that it results in an upset parent, and an upset toddler. 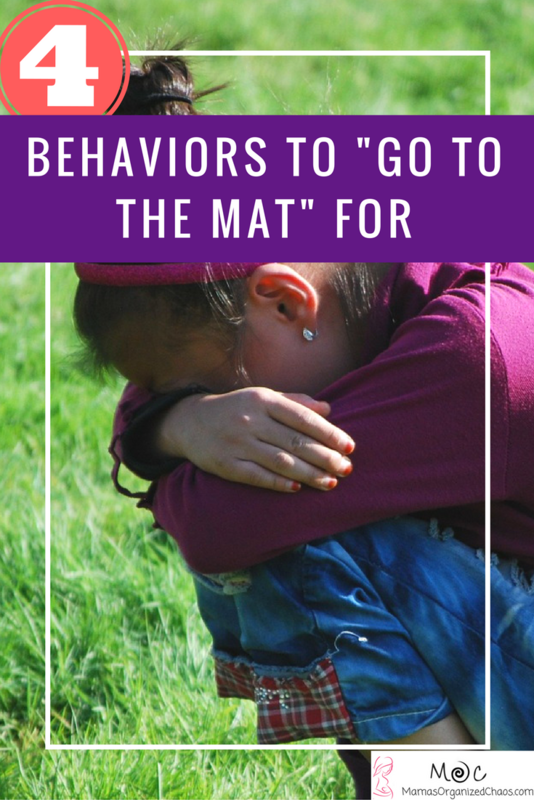 It escalates a situation instead of diffusing it, and it may result in a toddler that starts throwing a tantrum- and then you really do end up leaving- which, obviously, isn’t what you wanted to do. Or, you don’t leave, leaving the “threat” just that- a threat that wasn’t followed through on. This lessens the validity of your statement, and the next time it happens, your toddler will know you aren’t really going to do anything. You do NOT want to go down that road, because the reality is that you might have to make a statement like this at some point, and you need your toddler to take you seriously. A very similar situation happened to us recently. We were going on an evening walk at the golf course (one of our favorite things to do). It’s never been a problem before, so I didn’t think to give her a heads up about wearing her hat and mittens (this wasn’t necessarily safety related, but obviously important in cold temperatures for a little one that doesn’t know to express when they are cold). It was a cold evening and very windy, and she was refusing to wear them. We couldn’t stay if she didn’t wear them. She refused and lost it. Her choice was to wear the hat and gloves, or we go home. It was unfortunate, but that was the choice. We hadn’t given her a heads up because we’d done this several times and never had an issue. She was crying and not stopping. We couldn’t calm her down, and even with repeated attempts to explain the situation and give her a choice, she was not having it. We had to go home. It wasn’t what any of us wanted, but it was our best option. We weren’t trying to throw a threat out. We were telling her the reality and then following through on it. It doesn’t always go as planned. The important part is to know the outcomes that you are ok with, offer your choice, and then follow through. 2. Manners- Any time our daughter asks for something, the expectation is that she is to say please. If I offer her something and she doesn’t want it, instead of screaming NO at me, she is expected to say “No thank you, Mama”. If she is given something, the expectation is that she says thank you. She is expected to say hello and goodbye if asked to do so. This is something we work on ALL OF THE TIME. My husband and I model these behaviors for her to one another, and also with her. If I ask her to do something, I always say please. I make sure it is a statement, not a request, but I still say please. I want these behaviors to be second nature to her, and I believe that will only happen if she sees Mama and Daddy saying these things as well. This is another opportunity for a heads up on expectations. As we are headed to a friends house, I remind her that I’d like her to say hello to our friends when we arrive. “Caroline, when we get to ___’s house, I want you to say hello. Can you do that for me, please?”. She usually makes a sound indicating yes. I then tell her to “Say ‘yes, Mama’, please”. I don’t consider the discussion over until I get a “yes, Mama” from her. This tells me that she understands. In a situation like this, if she doesn’t say hello, I pull her aside and tell her that I’d like her to try when she feels comfortable. I then ask her again in a little bit. There is no consequence per say other than I tell her that I am disappointed if she didn’t try. I explain to her why it is important that we say hello, and how it can make someone’s day. Now, let’s say that my daughter politely asked Mama and Daddy for a cookie. We decided that she could have the cookie. We hand her the cookie and say “What do you say, Caroline?”. If she doesn’t say thank you, we remind her that she needs to “say thank you”. If she refuses to say thank you, the cookie gets taken away. Yes, that makes her upset, and yes we are ok with that. She certainly doesn’t need a cookie, but she does need to learn to say thank you. 3. Food- Food is something that I do not stress over. If our daughter does not eat her entire plate- no big deal. If she doesn’t want to eat at all- no big deal. We don’t do snacks. If she didn’t eat and she’s hungry later, she can have water and wait for the next meal. Here’s what we do expect- she needs to TRY everything before she gets more of anything. If she wants more bread, she only gets it after she’s at least tried everything else on her plate. Sometimes trying things results in her eating it because she realizes it is good! Sometimes she tries it and says that she doesn’t like it. We are ok with that. I certainly don’t want to be forced to eat things I don’t like, so we don’t force her to, either. If we can tell that she doesn’t hate something, we go the “if you eat 3 bites of X, you can have more Y” route. It usually works great without creating an unneeded battle. For a more in depth look at our rules of the table, read about “5 Rules For Our (Almost) 2 Year Old to Encourage Good Eating Habits”. 4. Listening- This is where I probably sound strict. Anything we tell her to do, she needs to listen. If we ask our daughter to do something, we expect her to do it. She needs to listen to us. If we say no, the answer is no. If we ask her to clean up, she needs to clean up. If we tell her it’s time for bed, it’s time for bed. Now, we don’t just surprise her out of nowhere. The benefit of having routine in our life, is that our daughter knows what happens after dinner (that we all help and bring things to the kitchen to clean up). She can choose what she brings, but she is expected to bring something. She knows that when her clock turns blue in the evening, it is time for bed. She hears “No” enough, that it isn’t life altering for her when she hears it. She is playing with a toy at the store, and refuses to put it back on the shelf. She doesn’t want to go to bed. I validate her feelings. I say something to the effect of how I know it’s hard to stop playing. I remind her we’ll get to do this activity again tomorrow. I then revert back to a choice: “Do you want to go potty first, or brush your teeth?”. She doesn’t want to clean up. Again, I validate her feelings. I also find a choice. “Do you want to pick up the blocks, or the stuffed animals?”. Or I tell her “Mama will put away the blocks. You can put away the stuffed animals”. And yes, I always help at this age (2). A recent example of follow through (but it didn’t go smoothly): This morning, she was playing with a blanket in her shopping cart. She decided she was done with it and threw it on the floor in the middle of the kitchen. I asked her to put the blanket away if she was done with it. She immediately started crying and throwing a fit. I helped her calm down first, then I told her again that she needed to put the blanket away. I also took the time to explain to her that someone could trip on the blanket. She said “No, Mama do”. Here was my choice that was offered up “Caroline you can either be done playing with the shopping cart and we’ll put everything away, or you can go put the blanket away and come back”. I was still met with “NO. Mama do.”. I took the blanket, put it in her hands and told her to go put it away. She cried the entire time, but she walked over and started to put it away. She then threw it on the ground and again said “NO. Mama do!”. At this point I was very firm and said “Caroline, put the blanket away, now. Mama didn’t get it out, so I’m not putting it away”. She was upset that I was upset and cried harder. I realized I needed to diffuse. I offered a hug to calm her down. She accepted. I then said, “Please put the blanket away”, and I walked away. I gave her space to let her guard down and put it away. She put it away and came back to play with her shopping cart. Did it go perfectly? No. I followed through, however. I think that is very important. I wasn’t about to just do it myself…then she learns nothing. I also wasn’t about to just leave it on the floor. We have a small kitchen and I didn’t want her sliding on it and falling (and no she’s not old enough to learn from that and put 2 and 2 together to learn her lesson). I ask her to come and she doesn’t come. I repeat myself. If still nothing, I go get her and bring her to the spot that I wanted her to go to. I explain my expectations, again and get a “Yes, Mama” out of her to make sure she understands that she needs to listen to Mama. Does it sound harsh? Maybe. Is it important to be consistent and have high expectations? Yes. Children thrive with clear, consistent boundaries. Does it go smoothly every time? No. Do choices help? Yes. Does a heads up help prepare them? Yes. Will my daughter still throw tantrums? Yes. Will they be lessened by all that we do? Hopefully so. That’s the goal! I think it works. She’s very well behaved, and she learns things quickly because we practice often. She listens to me incredibly well compared to other’s her age, and I feel that it is a direct result of our clear boundaries, high expectations, and approach with choices. Is she going to have bad days and good days? Of course! Am I going to have bad days and good days? Absolutely! There are days and moments that I forget my game plan and forget to offer a choice, or I forget to give her a heads up, or I overreact and get too upset at her reaction. I learn from it and I do better the next time. 1. Everything else. We don’t ask our daughter to do something if we aren’t willing to follow through. If the battle isn’t worth it, we don’t set the expectation to begin with. This requires that I think before I talk, so sometimes I mess it up. Here’s the thing…if I mess up, I just admit it to her and move on, instead of creating an unwanted battle. I apologize and tell her I was wrong. Sometimes you just don’t see it coming. Sometimes you say no to something and then realize that your child is crazy upset about it, and you didn’t really care to begin with. It’s ok to admit when you were wrong and move on. If my daughter wants to wear some crazy outfit, by all means wear the crazy outfit. It does not matter if it matches. My expectation is that it is appropriate (for the weather, and situation). If she’s going to gymnastics, she needs to wear something she can move around in easily, something that won’t get caught on things. If it’s cold out, she needs to wear a jacket. If we are leaving the house, she needs to wear shoes. If we are in public, she needs to wear clothes. I keep my expectations simple. If she wants to climb into the car seat on her own, as long as it isn’t freezing cold outside or we aren’t late to get somewhere, what’s it hurting? Sure, go ahead! If she insists on buckling the top buckle on the car seat, sure. Just do it. If she plays with it, it’s my turn. If she wants to stop and sit on the sidewalk while we are on our walk- sure. It feels odd to just sit on the sidewalk, and I’d personally like to keep walking, but if we aren’t in the way, let’s do it. If she doesn’t want to share her toy at the moment- that’s ok. Not every moment needs to be a huge teaching moment on sharing. If she was on the other end and wanted a toy, I’d tell her she had to wait for the other child to be done with it. She needs to be nice about it, but she doesn’t have to be done with the toy. If she doesn’t want to hug her grandparents hello- totally fine. Again, she needs to say hello and be polite, but she doesn’t have to hug anyone- ever. If she doesn’t want to eat anything- also fine. She can eat or sit quietly. If she wants to leave story time- sure, we just wait for an appropriate time to leave. We were there as a fun activity for her, so if she’s not having fun, let’s go. If she wants to drink from a specific cup- as long as it’s clean, we can do that. I am not going to upset her just because I already had the blue cup out- it’s an easy thing to switch and it will make her happy. You get the idea… we pick our battles and not everything is worth the energy. Sometimes, giving in or ignoring something that is an annoyance to you, will bring such happiness to your toddler. Drinking out of the pink cup made her day, but the blue cup was apparently the worst thing to happen to her. Unreasonable? Sure. But she’s 2. And I’d give anything to see see a smile brought to her face like giving her the pink cup achieved! Katrina has a 2 year old daughter and blogs at Mama’s Organized Chaos. 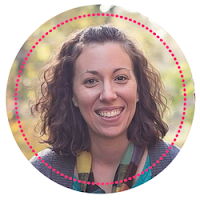 She’s a mama that breastfed, used cloth diapers, did sleep training, and loves Babywise!